Update: at 10:am EST Boston Comic Con canceled their event. Boston is on lock down while police hunt for the suspects. Boston Comic Con is postponed until further notice. Hello all. The Boston Comic Con will still be happening this weekend, despite the bombing earlier this week of the Boston Marathon. If that seems callous to you please remember that often the best thing you can do to help is to do your job. And the job of comic conventions is to bring the community together. There will be at least one change to the event, however, because of the sad act of Monday. The Boston Comic Con is asking ALL cosplayers to NOT bring any real or fake weapons to the event out of respect. A reasonable request. Under regular circumstances no one’s really threatened by a 6′ foam sword or fake stormtrooper blasters. But violent events change what people consider appropriate, and security gets extra jumpy. Best for all concerned that such costume props stay at home or in the hotel room this weekend. That’s probably a good courtesy to extend to any other convention or LARPing event costumers attend this weekend. Everyone’s nerves, whether in Boston or L.A., are a mite on edge at the moment. 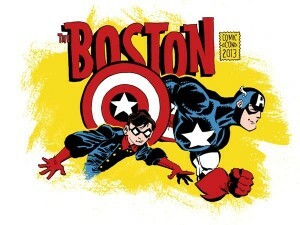 The drama aside, Boston Comic Con 2013 looks like it will be an exciting one. There are some great guest appearances scheduled, from Lauren Cohen of The Walking Dead to comic greats like George Perez, Amanda Conner, and Mike Mignola. Please note that Jon Bernthal has canceled due to a filming conflict. As a My Little Pony: Friendship is Magic fan, I’d like to point out that Boston will have a special convention-only cover for issue #6 of the comic book available. Limited print run of 1,000 copies. The Boston Comic Con is scheduled for this weekend, April 20-21 and will be held at the Hynes Convention Center in Boston, Massachusetts.Tickets are still available online. They will also be sold at the door.